Japanese From Zero! is an innovative and integrated approach to learning Japanese developed by professional Japanese interpreter George Trombley and co-writer Yukari Takenaka. The lessons and techniques used in this series have been taught successfully for over ten years in classrooms throughout the world. 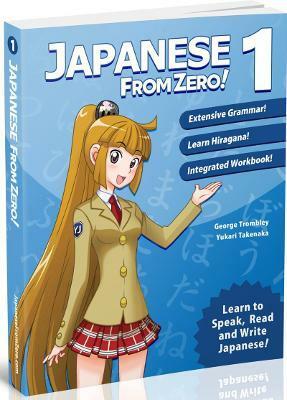 Using up-to-date and easy-to-grasp grammar, Japanese From Zero! is the perfect course for current students of Japanese as well as absolute beginners. In Book 1 of the Japanese From Zero! series, readers are taught new grammar concepts, over 800 new words and expressions, and also learn the hiragana writing system. Features of Book 1: * Integrated Workbook with Answer Key * Over 800 New Words and Expressions * Learn to Read and Write Hiragana * Easy-to-Understand Example Dialogues * Culture Points about Japan * Bilingual Glossaries with Kana and Romaji ...and much more! George Trombley is a professional Japanese interpreter who over the past 16 years has interpreted at corporations such as Microsoft, IBM, NTT DoCoMo, Lucent Technologies, and in countries throughout North America, Europe, Asia and the Middle East.